The experience cultivated for students at the Michigan State University Honors College is different for everyone, but in the case of one family, the transformation of this college over time is pretty clear. 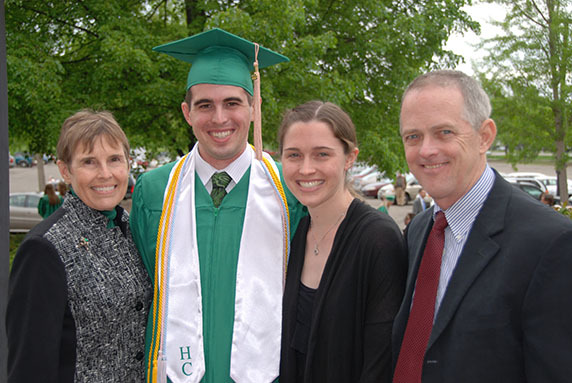 Chuck Stavoe and his wife, Laurie Horiszny, reflect fondly on their years at MSU, but when asked whether their Honors College experience differed from that of their children, Andrea and Ross, the answer was an affirmative yes. “When we came to Michigan State, we were automatically granted the initial (entrance) into the Honors College,” said Chuck, who was valedictorian of his high school class while Laurie, a 1977 alumna, was salutatorian for her high school class. The Honors College for Chuck and Laurie was limited to honors classes, said Chuck, a 1976 alumnus. Andrea Stavoe, a 2008 alumna, said she was weighing going to Northwestern University outside of Chicago over MSU because that’s where the family was living at the time. Eventually, she was swayed to head to East Lansing. For Ross Stavoe, a 2012 alumnus, the choice was clearer. “The Honors College is what made me come to Michigan State...the opportunities it afforded its members,” he said. While both were Honors College students, Laurie and Chuck didn’t actually meet at MSU. Instead they met in Jackson, Michigan, after both had finished their respective law schools and were working in the private sector. As a parent, it’s comforting to know your children are in the same environment you’ve experienced, Laurie said. Chuck said the hands-on opportunities afforded to Andrea and Ross made an impression on him as a parent and alumnus. Ross, who is in the finance leadership development training program for GE Aviation now, said the flexibility of the Honors College appealed to him. Andrea, who majored in biochemistry, molecular biology, and biotechnology and is now in graduate school at Yale University, said she expected her experience as a science student to be different than her parents, who were both in the business school. But the ability to engage and interact with professors is something that appears to have continued throughout the generations of Honors College students. Both Andrea and Ross worked as professorial assistants. Members of the family also participated in various student organizations, including H-STAR (Honors Students Actively Recruiting). “We’re very pleased and proud both of them did so well at MSU and launched into their different interests,” Laurie said. Besides shared MSU appreciation, the family also enjoys scuba diving around the world. Chuck runs Motor City Scuba and Snorkel in Novi, Michigan, and serves on the Honors College Alumni Association Executive Board; Laurie is an attorney. This article was originally published in HConnections 2013.